Immediately after developing a new design of the Stuntex MadDog cage for Yamaha R6 03-05, we tested it on Boris's motorcycle. We dropped the bike many times on purpose from one or both wheels. The most frequent falls during training are lowsides from a burnout or drift, as well as lateral falls from a wheelie. In general, the crash cage has worked fine. 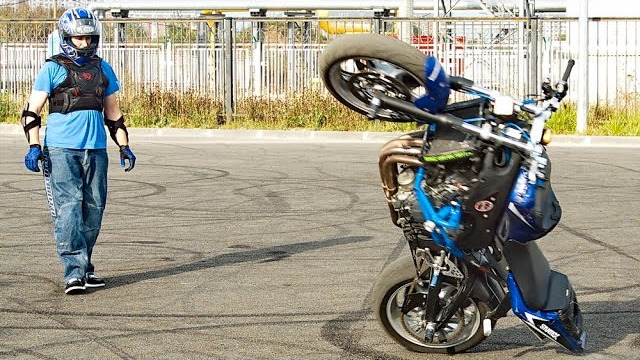 Thanks to the damper sliders, the motorcycle quickly stops after falling on its side, which is very useful when practicing in acrobatics, when the bike can ride far away and crash into an obstacle. The cage also protects the muffler and foodpegs with the help of Stuntex pegs. In the video down below you can see how well the cage works!